More than 200,000 administrators rely on the PRTG Protocol Analyzer every day - to capture network packets and monitor their LAN, WAN, Servers, URLs and more. Think of PRTG Network Monitor as your personal 24/7 protocol analyzer that ensures non-stop monitoring. PRTG's failover cluster ensures that not even a crash of your master server or a software update will interrupt your monitoring. PRTG's powerful monitoring engine is capable of monitoring several thousand sensors simultaneously. Each sensor can be "tagged" allowing for easy navigation through a long list of sensors. Network and bandwidth monitoring data generated by PRTG Network Monitor can be accessed via a web-based front end, a Windows application, or the iPhone or other mobile devices. 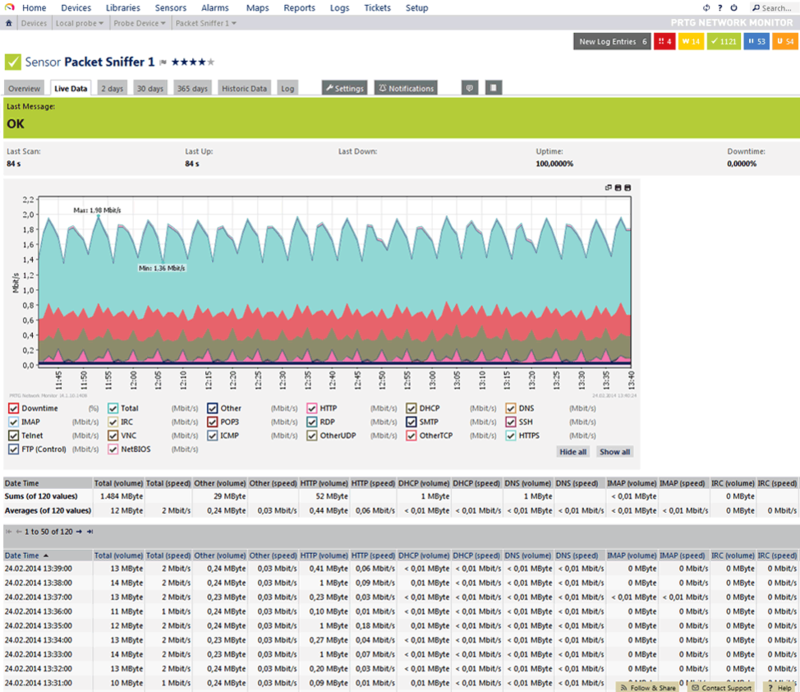 Extensive data filtering can be applied for Netflow / sFlow / jFlow and Packet Sniffing based on monitoring preferences. As your comprehensive network monitoring and analysis tool, PRTG supports data acquisition via SNMP, packet sniffing, and the NetFlow, sFlow and jFlow protocol. Using its built-in protocol analyzer and other analysis tools, PRTG can classify network traffic by IP address, protocol or user-defined, custom parameters. Analyzed results are displayed in a variety of easy-to-read graphs and tables, which can be generated almost instantly for near real-time network usage reporting. Fully configured reports are available in HTML, Excel, TIF, RTF, or PDF formats. PRTG's internal database allows for fast and efficient storage of collected data. Optional ZIP file data backup is also offered as well as purging of old data. PRTG installs with just a few clicks and is fully compatible with most switches, routers, firewalls and other network devices. Offering both a free basic edition and expanded commercial editions, PRTG is the right solution for all your bandwidth monitoring & analysis needs. All licenses of the PRTG protocol analyzer allow you to use an unlimited number of NetFlow / sFlow sensors. Read more about this protocol analyzer.